The recently released single “Falling Down” showcased a surprising collaboration between artists Lil Peep and XXXTentacion. The surprising part is that these artists were able to collab in the first place: Peep died in November of 2017, while X died in June of 2018. The truth is that the song wasn’t a mutual collaboration. Peep co-wrote and recorded a song titled “Sunlight On Your Skin” with musician ILoveMakonnen, but died of a drug overdose before releasing the final version to the general public. The hook was leaked to the internet after Peep played part of the song on his Instagram Live. Fans of Peep then put the snippet of his song on YouTube, where rapper XXXTentacion first found it. X recorded his own voice over Peep’s audio, but ended up passing away before the song was finalized. Since X was so driven to release the song, XXXTentacion’s mother ended up reaching out to Peep’s management. The song was then completed and released to the public, as a tribute to both artists. Peep, however, did not. 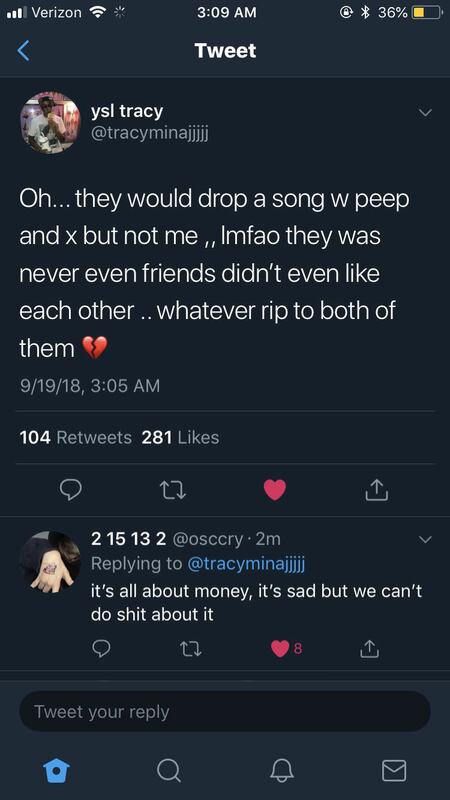 Rapper Lil Tracy, who Lil Peep frequently collaborated with during his lifetime, tweeted that Peep and X were “never even friends [and] didn’t like each other.” Peep never heard the XXXTentacion feature and was not alive to approve it. Regardless of the drama surrounding the release and tension between the two rappers, we can only conclude that there is no way to know for sure what Peep would have thought. ILoveMakonnen is alive and Lil Peep isn’t, but should this give him the right to do whatever he wants with music half made from a deceased artist who can no longer voice his own opinions and values? At best, this song aims to honor both artists posthumously; at worst, it is purely a marketing tactic used to attract fans from both audiences and make more money. Like many issues in music, the situation comes down to who has the rights and who has the money. Columbia Records acquired the rights to Peep’s unreleased music, and therefore Columbia, not Peep’s own mother, has control over what sees the light of day and what remains hidden. Columbia plans to release a full posthumous album of Peep’s unreleased material, and the lead single will be “Falling Down.” This raises questions of artistic integrity: If Peep wouldn’t have wanted this song to exist, why should a major label decide how Peep’s vision is carried out after his death? Is there any way for artists to remain true to their own desires if they cannot voice these desires for themselves? Should rights to an artist’s music remain even after an artist is no longer alive? Royalties do not cease to exist when musicians do, and often, dead musicians generate higher sales than living ones. Forbes Magazine posts lists of top-earning dead celebrities every year, and in 2017, they reported on Michael Jackson, who had been dead for years, stating “Jackson tops our list of the 13 highest-paid dead celebrities for the fifth year in a row–with earnings of $75 million. His postmortem empire is going strong, boosted by the Halloween special and new album Scream, which Jackson, of course, had no part in putting together. The root of the issue comes to light here: A magazine about money showcases dead artists because their revenue is impressive. There is no mention of creating projects using Jackson’s music because it touches lives or because his fans care about his legacy. According to lawyer Joseph D. Schleimer, when an artist dies, sales spike immediately before slowing down over time. Ironically, natural deaths do not generate as much revenue as young or unexpected ones. This means if an artist is purely concerned with increasing their long-term worth, they are better off dying at the age of 21 than 81, even though theoretically an artist can create more music the longer they live. Perhaps even more depressing is the idea that because a dead artist is unable to spend the money they make, their estate is often worth more after they die. Public domain rules affect these situations. In the United States, copyrights hold for 75 years maximum after an artist’s death. After this time, the estate does not receive royalties. Estates generate revenue because the copyright on works of art gets passed on to relatives or organizations after death, and once this is public domain, these rights can no longer be passed along. The larger the profits, the more these rights are questioned. Beyond profits and marketing rights, rights to an artist’s work include the ability to release or hold music. Being part of a late artist’s estate can be extremely profitable, but there is more at stake here than money. There seem to be little ethics involved with owning the work of a deceased artist. Although public domain stops certain types of profit, this does not occur for decades after the artist’s death, and does little for the family and fans affected by the tragedy. In Peep’s case, the debate is over whether or not he would have wanted the collaboration and/or release of “Falling Down.” On a larger scale, the debate is if there is any way to protect the rights of artists who were more concerned with their vision than their profits. To combat this, record labels and producers should consider the wishes of the artist they are making so much money off of. It’s time to prove Lil Peep right and concentrate on missing him as a person and artist, not only for the revenue his work continues to generate.